Morten E. Solberg is an artist's artist. He is versatile in all mediums. He paints in oil, acrylic and watercolor and his techniques range from photo-realism to total abstraction. Years of pursuing his craft via design studios and commercial art brought Mort to the West. Mort attended The Cleveland Institute Of Art studying painting and design. He shed his commercial ties and concentrated on fine art and has been painting full time since 1970. After moving to Southern California's Orange County in 1968, he firmly established himself in the art world with memberships in the American Watercolor Society, the National Watercolor Society, the Society of Animal Artists, Wildlife Artists of the World, Knickerbocker Artists and the Society of Master Impressionists, as a lifetime Master member. Awards and inclusions in prestigious collections followed. His paintings have graced the covers of numerous magazines, and he has been featured in American Artist, Wildlife Art News, Art West, Watercolor, Sports Afield, Sporting Classic, Southwest Art and Orange County Illustrated. In 1986, American Artist chose Mort as their "Artist of the Year". His accomplishments have earned him listings in Who's Who International Biographies, Who's Who in America, Who's Who in American Art, and Who's Who in the West. In 1993, Mort was elected to U.S. Art Magazines "Artist Hall of Fame". In 2001 Wildlife Art Magazine established Mort as a "Master Artist". Mort's work has been published as limited edition prints since 1977. 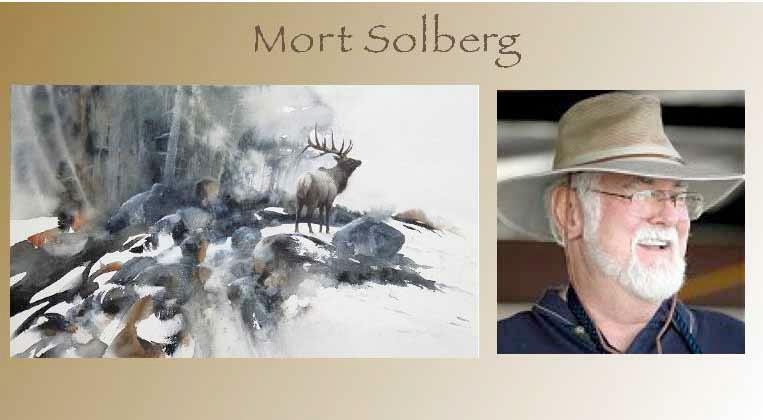 Mort's work has taken top awards in many of the exhibitions he has entered, including the American Watercolor Society, the National Watercolor, the Society of Animal Artists and the Arts For The Parks Grand Prize of $25,000 and Gold Medal. His work is represented in many collections including the Smithsonian Institution, National Gallery of Art, National Academy of Design, The Leigh Yawkey Woodson Museum Of Art, The Dunnegan Museum Of Art, The National World Museum Of Environmental Art, American Artist Magazine, Wildlife Art Magazine, National Parks Academy For The Arts and many private and public collections. States where he now lives on Padre Island, Corpus Christi, TX. He also maintains a studio in Loveland, Colorado. World-renowned artist John Seerey-Lester was born in Manchester, England, where he grew up with a sketchbook in hand. Receiving his first commission at the early age of 13, John became a professional artist in 1974. For some ten years prior to this, John was a journalist, freelance writer, editor of several magazines and worked in advertising and public relations in both the private sector and local government in the UK. Before painting wildlife, John painted figurative works and portraiture, which he still undertakes. On his travels to different parts of the world, he continues to do figurative work between his wildlife paintings. John has received many awards and much recognition for his outstanding achievements in the field of wildlife art. He was presented to His Royal Highness Prince Phillip and was commended for his work in conservation. He has been chosen to exhibit works in the prestigious Leigh Yawkey Woodson Art Museum's "Birds in Art" and "Wildlife: An Artist's View" shows each year since 1983, and his paintings are in their permanent collection. He has also displayed in several other museums such as the Gilcrease Museum , the National Museum of Wildlife Art, and in many other permanent collections such as Bennington Center for the Arts and Nature in Art Museum. He is a member of Oil Painters of America and is the Artist of the Year at the Southeastern Wildlife Expo in Charleston for 2004. Recently John has become well recognized for his paintings depicting historical hunting scenes. A book entitled LEGENDS OF THE HUNT feature this series of paintings. 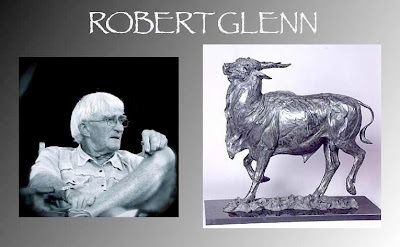 Robert Glenn was born in Kenya in 1940 and his interest in art and natural history formed at an early age. A fascination with birds and all living things led him to the Nairobi Museum of Natural History. It was at the museum where he met the curator of ornithology, John Williams and quickly established a long and enduring friendship that greatly influenced his life’s work. Glen’s public commissions include one of Texas’ proudest monuments and one of the largest equestrian sculptures in the world, the Mustangs of Las Colinas in Irving, Texas. Today, Rob continues to work out of his simple camp studio, where he has lived for the past fifteen years with his partner, the accomplished painter Sue Stolberger. Together Sue and Robert inspire each other's work as well as their passion for natural history, ecology and conservation. The Society of Animal Artists highest award! 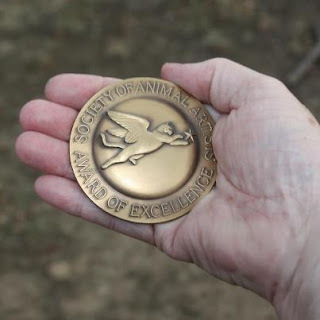 The highest honor presented by the Society of Animal Artists, it is awarded to those pieces judged to represent the highest standards of artistic excellence. The jurors for the Awards of Excellence are chosen by the venue which is hosting the the exhibition. Their proposed list is submitted to the SAA board for approval. Therefore, while the selection of the work that will be in the show is done "in house" by SAA members who are asked to serve by the Jury Committee, the awards are given by a different set of non-member jurors every year and include museum directors and curators, gallery owners and other qualified individuals. The judges are asked to select a minimum of six (6) recipients for this award - and no more than ten (10). Work is to be selected on the following criteria: A. Creativity B. Design and Composition C. Demonstrated Mastery of Medium. Subject matter should NOT be a factor in determining the excellence of the ART. The Awards are given as medallions with the artist's name and date engraved on the back.